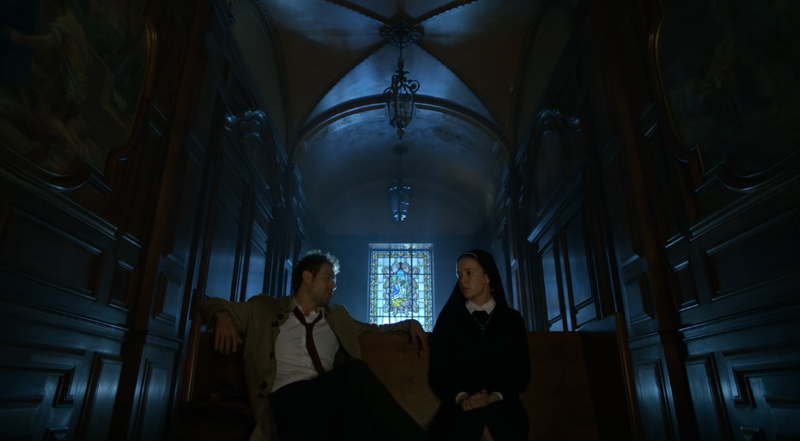 In one of the strongest episodes of the season, Constantine visits a Mexican convent for a tale about babies and the creatures that steal them. But even as John learns the truth behind the Rising Darkness, he and Zed find themselves (separately) in very deep trouble. Dear John Constantine: you may want to take Zed's precognitive drawings a bit more seriously. They could help you avoid some nasty surprises. Zed begins the episode by sketching up a creature called an invunche, something John attributes to her hand-to-heart contact with last week's fallen angel. It doesn't occur to him that, by the end of his latest adventure, he could be fending off one of the demon assassins. And, when an old flame of John's, Anne Marie, projects herself into the millhouse asking for his help with a Mexican baby snatcher, John leaves Zed off the case so she can continue to recuperate. Of course, neither John nor Zed realizes that Zed recently had a brush with someone linked to her past. He leaves the magical locks on before he goes. John and Chas head down to Mexico where Anna Marie, out of guilt for her part in the Astra exorcism, has become a nun. Just her luck, she can't escape her supernatural-fighting past and her convent has been plagued by a creature that steals newborns and sometimes kills young mothers. It's an episode that filled with the things we love best about Constantine: creepy visuals and John being a general cad. When Constantine and Anna Marie find the spot where a stolen baby's placenta is buried, John cuts into the flesh-covered fruit of a nearby pear tree, which starts spurting blood. It's a great moment, one with a dark, Biblically-flavored feel perfect for a mid-season finale. And when we get to the root of the problem, the show name-checks a bunch of baddies from Swamp Thing: the Brujería, a cult of ancient South American warlocks who have managed to employ the Mesopotamian baby-eating goddess Lamashtu, whom Constantine identifies as one of Eve's sisters. Once Constantine learns of the Brujería, he identifies them as the force behind the Rising Darkness. Neither John nor Anna Marie is particularly delighted by their reunion, but Anna Marie makes an interesting foil for John. She knows John well and has little patience for his jokes and his passive-aggression, but both of them are able to put aside their differences to finish the job. And when John, while talking her into baiting Lamashtu, breaks through her fear by telling her that no price is too high to save the innocent, she genuinely agrees. But for all her fear, Anna Marie is dangerous when she needs to be. John manages to confront Lamashtu in a sewer and learns why she is working with the Brujería: to merge Hell with Earth so that the demons and monsters will no longer have to hide from humanity. Humanity will have to hide from the demons. John banishes the damned goddess with relative ease, but that's not the end of this story. Because what does he encounter next? That's right, the invunche from Zed's sketches. And it's a delightful monster. Just look at it go. Constantine has no idea what to do, but Anna Marie does. She grabs a gun and reminds Constantine that no price is too high to save the innocent, and she shoots him, wounding him so she can get away with one of the babies. John greets this betrayal with a wry smile. But of course, now he's stuck in the sewer with the twisted creature headed his way. Cliffhanger numero uno. Then there's poor Zed. She leaves the millhouse to shop for art supplies and runs into the traitorous art class model Eddie. Eddie convinces her to go out for a drink, but her psychic powers kick in and she realizes who Eddie's working for. And sure enough, Eddie shows up later at the millhouse, calling Zed "Mary" and spouting off about the Resurrection Crusade and how Zed is their savior. Too bad for Eddie, the Crusade's minions shoot him dead the moment Zed threatens him and they start chasing Zed through the millhouse. She manages to lead one through a door that drops into an abyss, but the other one manages to catch her and inject her with a tranquilizer. And that's where our mid-season cliffhanger dangles us, with John wounded and about to be demon chow and Zed being shipped off to dear old dad. Even if it's been a little rocky getting there, it's nice to see Constantine headed into its hiatus on a high note.